1. Jumping spiders belong to the family Salticidae. This is a large diverse group of spiders of about 4,000 species worldwide, 300 in the United States. 2. Salticids are diurnal and are often seen foraging on garden plants during the day. Jumping spiders found inside houses are generally brown, black or grey, whereas those found outside in gardens are often brightly coloured. 3. These spiders are relatively small, usually less than 2 cm. They are often brightly colored with reds, whites and even metallic green, particularly their jaws. 4. They are extraordinary jumpers, and are known to be able to jump distances more than 10 to 40 times their body length. 5. Male jumping spiders often have bright colors and highly modified from legs. They use these colors and other modifications to attract female spiders for mating but to also avoid being eaten in the process. 6. Males perform courtship “dances” for females prior to mating and often serve as a post-copulatory meal to hungry females. 7. Concealed silken tube-like retreats serve as sites for molting, egg protection and overwintering . Depending on species and location, jumping spiders may overwinter as adults, immatures or sometimes as eggs. 8. One of the most fascinating things about jumping spiders is their vision. Most spiders catch prey on webs and have a keen tactile sense for detecting vibrations. Jumping spiders, on the other hand, do not construct webs for catching prey. They actively hunt during the day, sneaking up on and catching their prey. As a result they need very good vision to capture prey. 9. As with almost all spiders, jumping spiders use silk to lay down a trail, cover its eggs, and construct temporary shelters. 10. Jumping spiders have eight simple eyes (not compound as in insects). One pair of these eyes are especially large on the front of the cephalothorax. These larger eyes have excellent resolution and are stereoscopic, like our own eyes, for detecting distance. The smaller eyes are less sensitive and may be good at detecting motion. 11. 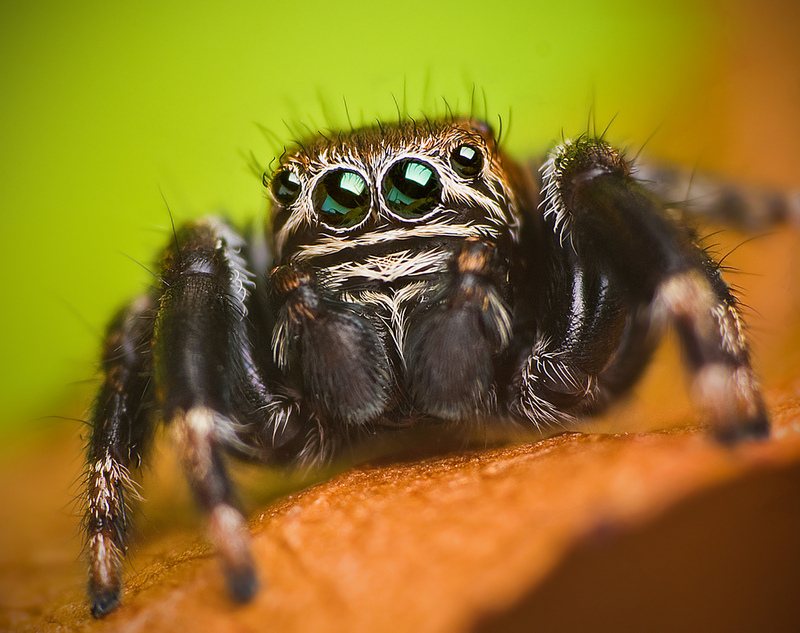 Jumping spiders cannot move the lens of the eye, but are able to rotate the retinas within their eyes. Because the retina is the darkest part the eye, as it moves the eye appears to change color, and due to this color change you can see the spider track your movements. 12. Jumping spiders are carnivores and can be effective garden pest control agents. They eat insects and other spiders about their size or smaller. They do not spin webs for catching prey, but may use a silken thread as an anchor as they climb down a vertical surface. 13. These spiders are generally harmless to humans. They can bite but this normally only happens when the spider is being crushed or other similar situation where its threatened with damage. The bites range from asymptomatic to small, mosquito-bite-sized welts. They are not as severe as a bee sting.